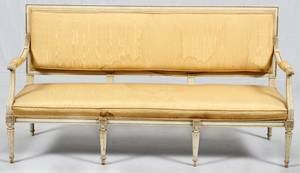 Mid-20th C. painted frame sofa with molded leaf decoration, LXVI style, with brown velvet upholstered single cushion seat on eight legs. 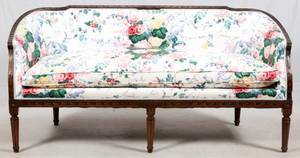 31.5"H x 78"W.
Louis XVI Style Upholstered Carved Mahogany Sofa. 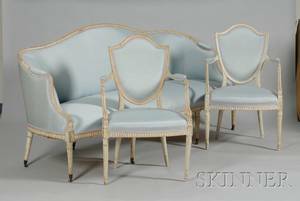 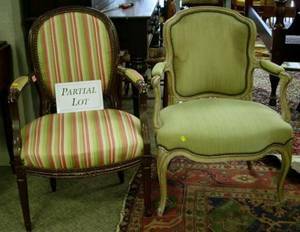 Pair of Louis XVI Upholstered Painted Wooden Fauteuils and a Louis XVI Style Upholstered Painted Carved Wood Armchair. 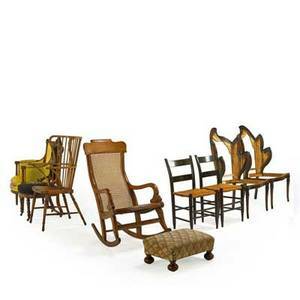 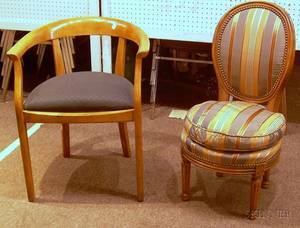 Louis XVI Style Upholstered Armchair and a Federal-style Upholstered Tiger Maple Armchair. 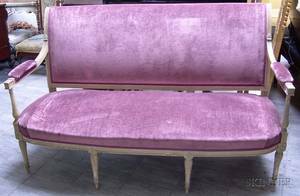 Louis XVI Style Upholstered Beechwood Footstool and a Georgian-style Upholstered Carved Mahogany Stool.